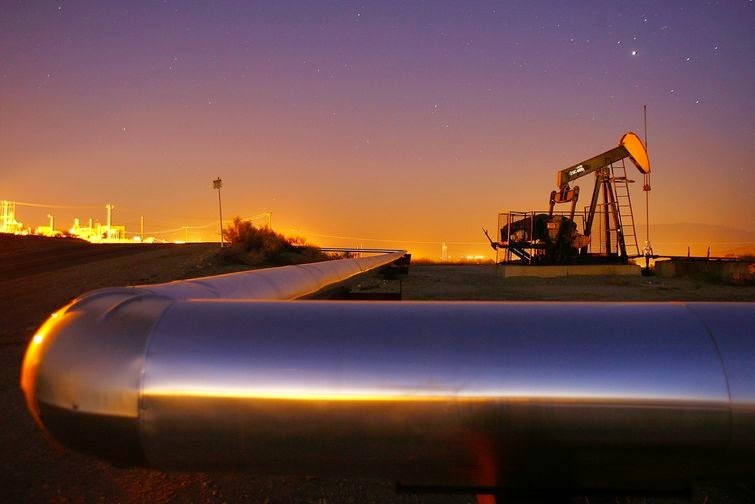 The Oil Producing and Exporting Countries decided not to cut back on production despite the fall in brent crude from $100+ to $67 over the past Five months at the meeting in Vienna on 27th November 2014. Something unusual as they have resorted to this time tested measure whenever there has been even a hint of fall in prices,leaving aside the subprime meltdown in 2008. 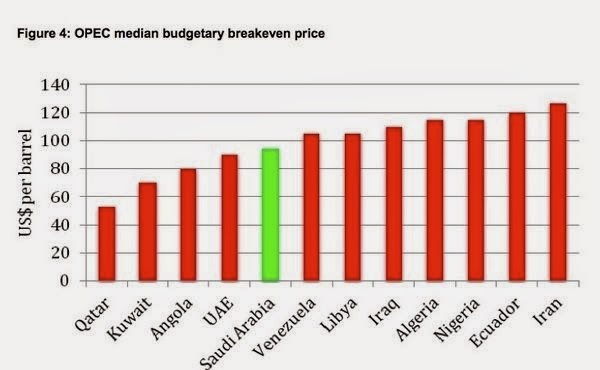 Essentially that means a price war between OPEC and the United States.A really risky strategy that blithely assumes that by keeping the rates crude down,explorers and extractors in the US will shut down the shale gas drilling wells due to them becoming unprofitable below $80. The risk to most OPEC countries is that they need higher oil prices to balance their budgets.Iran for one has been feeling the pinch.This is the other side of the story. In early 2000s when the explosive and sudden growth in China led to huge demand,the oil companies found that for many years no major discoveries had taken place and not much investment had been made in exploration infra.Result.Crude traded between $100-115 during 2011-14. Many firms in this field suddenly found it profitable to extract difficult to drill Oil. 'Fracking'(incidentally which led to a rally in guarseed prices in India)and 'horizontal drilling in US and Canada led to an addition of almost 5 million barrels of fresh crude to world supplies. What kept prices low was the civil war in Libya,Iraq and sanctions against Iran that took 3 million barrels per day off the global supply.Iran and Venezuela did try to pressurize the Saudis to cut back production but as happened in the 1980s when prices declined and the Saudis cut production yet crude prices kept falling anyways resulting in Saudi Arabia losing market share. In the short terms signals emanating out of Saudi Government sources suggests that they can,in the short term,live with prices around $80 as they have built up massive foreign exchange reserves. This looks like a battle between pumping oil cheaply out of Qatar,Kuwait and Saudi Arabia versus costly extraction from Texas,North Dakota.Reports suggest that the Bakken formation in Dakota can still be profitable as long as prices are above $50. Conpiracy theorists might feel that this is an attempt by US interests to unsettle the Russian economy for interfering in Ukraine.I for one feel that its a straight out battle between the United States and OPEC. 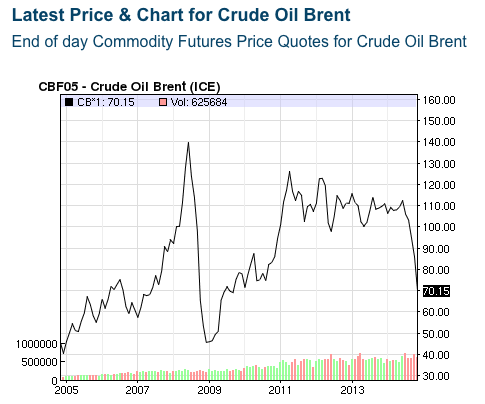 Oil prices are still higher than a decade ago when crude was trading at an average $40,so with time we will see if OPEC can drive US,Canadian drillers into bankruptcy or themselves lose their nerve and cut production. Investors in Russia and Iran will certainly be tested in the coming Year.